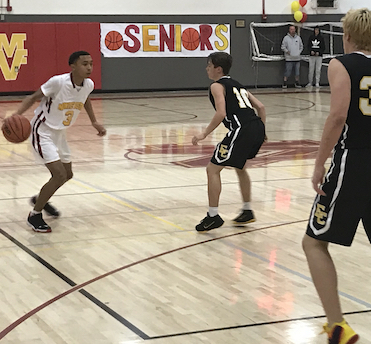 SPRING VALLEY – The El Capitan Vaqueros may have earned their way to a home game in the upcoming San Diego CIF Division IV playoffs by defeating the host Monte Vista Monarchs on Friday night. The Vaqueros earned the No. 8 seed but will not be a host in the opening round on Wednesday. Ninth-seeded Victory Christian Academy by way of its co-championship in the Citrus League will play host on Wednesday at 7 in the opening round of the San Diego CIF Division IV playoffs in a game to be played at Park Way Gym in Chula Vista. The Vaqueros made a wild comeback late in the win over Monte Vista, as they trailed for most of the contest. 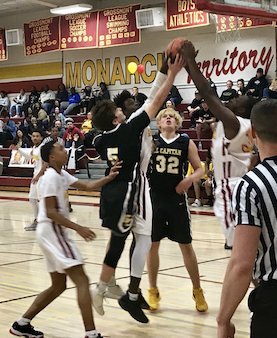 The Monarchs built a double-digit lead at 36-24, but El Capitan sophomore R.J. LUGTU had a pair of buckets, then junior guard JACOB PFITZNER had a pair of three-pointers to lead the second-half charge. The Monarchs were led by senior DEMARCUS MCKAN, who did everything he could in the final period to try and stem the tide, scoring 11 of his 24 points. Senior DERRICK WILEY had 19 points and eight rebounds for the Monarchs.